A man who wears a tin foil modified head covering (yes, a tin foil hat) was arrested for threatening a school attack by fire. Read more, here. Fortunato went on to say, "After being transported to the JPSO CIB, Kersey, once again admitted making the phone calls to the schools...Kersey also stated he overheard a conversation at a bus stop in Lafitte that there was going to be some fights between students and that unknown persons were bringing combustible materials to school." Hugo Chavez was a lieutenant colonel wasn't he ? In that story, we have "Sherriff's spokesman Colonel John Fortunato says ..." Strong synchronicity. Poor guy looks like he's suffering from insomnia; I guess it's all those messages beamed into his head. The key phrase for me was that the police traced him "by his cell phone." Yes, that little plastic object in your pocket can and will be used to divulge your location. 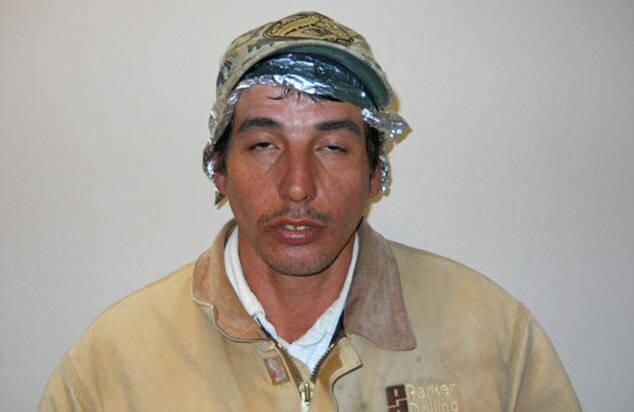 He should have wrapped the phone in tinfoil, not his head. WoW! A dual synchronicity to Shane, AKA the Titan Prometheus, LOL. Interesting.